At least 549 people died and another 295 are still missing as a result of floods which struck North Korea last month, a pro-Pyongyang daily said. 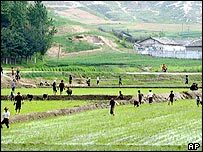 Days of heavy rain caused flooding which North Korean media have already confirmed led to "hundreds" of deaths. But the figures, from the Japan-based daily, are the most specific released so far on the extent of the disaster. Last month, the UN food agency estimated that about 60,000 people had been left homeless by the flooding. The Choson Shinbo newspaper is based in Japan and is run by a pro-North Korea association. Over 7,000 homes were destroyed or damaged, the daily said, and almost 40,000 acres (16,000 ha) of farmland had been washed away. "Recovery efforts are proceeding at rapid speed as relief supplies are being sent to the afflicted areas," the daily said on its web site. In South Korea, opposition Grand National Party leader Kang Jae-sup urged that a fact-finding mission be sent to the North to determine the full extent of the damage there, Yonhap news agency reported. One activists' group has suggested that the number of dead or missing is as high as 10,000, but has not said where it obtained the information. North Korea is secretive about releasing details of accidents or natural disasters, making any confirmation of the extent of the flooding difficult. But Pyongyang has cancelled a mass gymnastics display, called Arirang, which is a key source of income for the nation, to focus, it says, on recovering from the floods. North Korea has refused offers from international agencies to launch appeals on its behalf, but an official said last week that Pyongyang would accept aid from the South if it came with no strings attached. South Korea has suspended food aid to the North because of concerns over deadlocked talks on its nuclear programme and Pyongyang's recent missile tests.